This article deals with the use of video-recordings of spontaneous interactions in workplaces as resources for training courses. 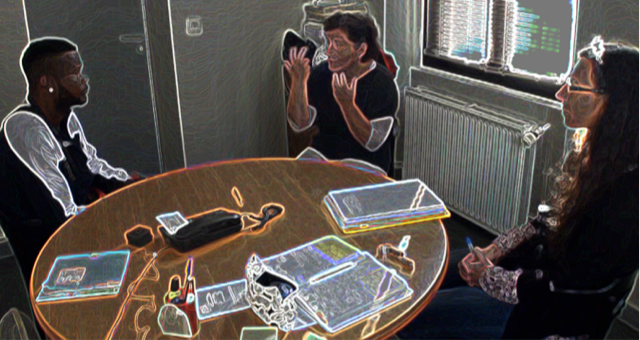 It focuses on a multilingual psychotherapy consultation with a refugee in France, in which an interpreter was present. Drawing on multimodal interaction analysis, this contribution shows the coordinated and collaborative dimension of meaning construction in a therapist-initiated question-answer sequence and the way it is dealt with by her co-participants. The detailed analysis of the interaction highlights the challenges of translating the therapist's talk when it embeds medical as well as cultural assumptions regarding the patient. A discussion of the implications of this type of analysis for interpreter-mediated consultations and of the interest of an interdisciplinary approach to data analysis concludes the article. ©inTRAlinea & Anna Claudia Ticca (2018). "The interpreter’s activity between complexity and simplification in psychotherapy sessions"
Using video-recordings of spontaneous interactions to observe, understand, and learn how social interactions are carried out in workplace situations has offered solid results, as far as training is concerned. The detailed analysis of interactions recorded as they naturally unfold makes it possible to grasp the micro details of participants’ communicative practices, thus revealing both to the analyst and to the trainees some constitutive aspects of the observed interactions that are not immediately visible to an ‘untrained’ eye. The study presented here focuses on a video-recorded psychotherapy session between an Angolan asylum seeker speaking Portuguese and a French therapist, in which an interpreter speaking Portuguese and French is also present. Extracts of such interactions have been used in training courses for interpreters and health and mental care professionals in order to improve communication among practitioners, interpreters, and users. In this paper, issues related to the sequential order of turns at talk, question-answer sequences, and translation sequences will be foregrounded. The aim is to enhance the awareness of both interpreters and healthcare professionals of the importance that the micro details of the interactants', multimodal behaviour may have for their professional practice. The data selected has been drawn from a large corpus of video-recorded social encounters collected as part of an ongoing research project on communication between refugees and healthcare professionals in France. In what follows, I will present the background of this study, the methodology used in this analysis, and the specificities of the chosen situation. I will then focus on the analysis of the psychotherapy extract mentioned above and I will point out some interactional and therapy-related phenomena that can be used in the framework of training interventions. A discussion of the implications of such phenomena for the work of both practitioners and interpreters and some final remarks about the interest of combining data analysis from an interactionist perspective with data analysis with both practitioners and interpreters will conclude this article. This study is part of a larger research project (see note 1) that investigates the way refugees and migrants communicate in social services and health and mental care situations. A key motivation is to uncover the social and interactional problems that may occur when a linguistically and culturally diverse population present in France faces an unknown and objectively complex administrative system organised to offer them healthcare assistance during their stay in the country. The main objectives are to understand and describe how mutual comprehension is built in multilingual interactions, what resources (linguistic; multimodal; human, e.g. interpreter; technological, e.g. translation software) participants use in order to make themselves understood, and how mutual comprehension is built when such ‘mediating’ resources are used in these multilingual social encounters. Questions related to identity construction and cultural assumptions emerging in interactions are also central concerns. Our study is largely based on the fine-grained analysis of video-recorded interactions taking place in different settings (healthcare, psychological and psychiatric consultations, as well as encounters with social workers) during different moments of migrants’ trajectories in the host country. So the participants in our corpus range from newly-arrived asylum seekers interacting with general doctors who will give them the needed paperwork to get access to social healthcare assistance, to longer-term migrants whose first asylum request has been rejected, consulting healthcare as well as mental care specialists. Such diversity of situations and participant status spurred us to deepen our ethnographic research on how the French reception system responds to both short- and long-term migrants and asylum seekers, who indeed require different medical and social assistance. How long a migrant has been in the country has an impact, in fact, on how he/she understands and experiences the French (reception) system, and interacts within it. Moreover, the ethnographic perspective taken has led us to establish a deeper relationship with the practitioners, who offered us their insights regarding their therapeutic and specialist interventions. The results of our study are therefore based on a multi-layered understanding of the observed situations, built on this diverse set of ethnographic data as well as on the micro-analyses of the interactions in the different contexts. With this research project we not only wish to contribute to the understanding of how interactions in such diverse contexts are carried out and how mutual comprehension is built in presence (or absence) of interpreters, we also wish to transmit the knowledge gained back to the social actors involved, in the form of training courses and awareness campaigns. The particular extract that will be presented in this article has been the object of a close analysis by the REMILAS team before then being presented and extensively discussed in training courses. Some considerations about the importance of discussing data collected in their natural ecology with the social actors involved in similar interactions will also be presented in section 6. 2. build an awareness of the importance that participants (and therefore the analysts, whatever their professional or academic background is) attribute to the linguistic and multimodal details of interactions, and the place these have in the construction of mutual understanding and in the construction of social actions in general. Were we to illustrate what is meant by this with an example, let us imagine that any given situation in an interactional event is much like a painting, whether abstract or figurative. Every element, every detail, every brush-stroke of a painting is there for a reason. Each contributes to the whole composition of the represented image, put intentionally there by the artist. Likewise, in interaction, everything the participants do and say with the semiotic resources available in the space they occupy during the communicative event, is meant to ‘accomplish’ something within the situational event as a whole. Our attention to details is guided by this perspective, which considers as relevant and worthy of analysis each detail occurring and taken into account by participants in the course of their joint activity. The basic idea underlying our general effort to explain how people communicate and understand each other when engaging in a social activity is that interaction is sequentially organised, with turns at talk subtly designed. Participants in an interaction orient to such sequential organisation and turn design in order to make sense of and construct the activity underway (Sacks, Schegloff & Jefferson, 1974). Conversation Analysis (CA) is the scientific discipline that for about 50 years now has analysed the micro details of language use in interaction to uncover, in many different languages, such order and systematic development of mutual actions in both ordinary and institutional settings (Sidnell & Stivers, 2012). More recently, scholars begun to get interested in how the application of CA methodology and findings can offer an understanding of and solutions to social problems (Fillietaz, 2014; see also Antaki, 2011, for the historical development of the aims and applications of CA). Basically, the microanalysis of talk – and body – in interaction offers a way (1) to observe the construction of social relationships in its situated accomplishment and macro social assumptions (see Kitzinger, 2005, on gender issues for instance, also quoted in Antaki, 2011), (2) to identify patterns of interactions that systematically occur in institutional encounters (see, for example, Heritage and Maynard, 2006, on medical consultations; Mehan, 1979, on classroom interactions), and (3) to describe features of multilingual interactions in presence of an interpreter (see, among many others, Traverso, 2003; Gavioli, 2009; Baraldi & Gavioli, 2012; Merlino, 2012; Licoppe & Verdier, 2013; Ticca & Traverso, 2017a). The potentiality of such approach for professional, institutional, and educational purposes, extensively explained in Antaki (2011), consists of using the results of analysis to build awareness and propose some changes in the situational contexts observed. So, for instance, once a given situation has been observed and its functioning understood, one further step can be to ‘solve’ a problem that has been recurrently identified (e.g. how to recognize parents’ expectations in paediatric encounters, as in Stivers et al., 2003). The fine-grained analysis of interactions can also be used to show trainers how the teaching/learning process takes place in real-life training situations (Fillietaz & Trebert, 2015, Pekarek Doehler et al., 2017). Examining short segments of conversations such as question-answer sequences, analysing the format of the question and the type of response it projects can shed light on problems that emerge at an interactional level. So for instance, difficulty in getting the expected answer might be due to the format used to solicit it. Hence, analysis of such question-answer sequences can be particularly informative for identifying both the internal rule governing the two elements (known as the conditional relevance) and the social relational dimension such a sequence embeds. As for the former, the production of a question projects the relevance of an answer. If the answer does not come, some problem is probably emerging, and a repair activity is likely to be initiated (Schegloff, 1968). As for the latter, in interpreter-mediated interactions, the interpreter typically makes the accomplishment of the question-answer sequence possible: by translating the question to the co-participant, she allows an answer to be produced, which is subsequently translated to the first participant. Previous studies (e. g. Ticca & Traverso, 2015b) highlighted the interactional work done by the interpreter in order to provide what she seems to consider the right answer to the doctor’s question. In other words, the constraint embedded in the production of a question becomes a shared responsibility, with the interpreter in charge of ‘safeguarding’ the coherence of the two elements of the sequence. Without focusing on the interpreter’s role in the elaboration of meaning during question-answer sequences, which would take us too far from the main focus of this contribution, it will suffice here to signal two things: the relevance of having a closer look at the format of the professional’s questions and at the way interpreters deal with them. The proposed extract is drawn from a psychotherapy consultation taking place at a day-centre (centre d’accueil de jour) located in the Savoy region in France. The day-centre hosts several associations which offer medical services to a population that are socially and economically at risk. The psychologist participating in the interaction selected for this study forms part of the ‘hospital’s mobile psychiatric insecurity care team’ (Equipe Mobile Psychiatrie Précarité), which offers its services at the day-centre a couple of days per week. Users are mostly migrants and asylum seekers who show distress for reasons typically related to their migratory process and/or to their precarious situation in France (Belmant, 2001; Chambon, 2017: 333). As part of our research, we have carried out an extensive ethnographic study of these situations by interviewing the social workers, migrants, and healthcare professionals who participate in them, and by video-recording the mental health consultations themselves. Out of a total of 15 consultations recorded, 6 were conducted in the presence of an interpreter. The particular interaction studied here concerns an Angolan asylum seeker who has been in therapy with the same psychologist for about two years. His first asylum request to the French Office for the Protection of Refugees and Stateless Persons (OFPRA) was rejected. He subsequently filed in an appeal with French National Court of Asylum (CNDA) and at the time of consultation was awaiting a response. Raul (the pseudonym with which we will call this participant henceforth) speaks Portuguese, Kikongo, and Lingala (some of the languages spoken in Angola), the former being the language used in his consultation. An interpreter speaking both French and Portuguese participated in this interaction. Since the beginning of Raul’s therapies, she has been the interpreter for his consultations. The French-speaking psychologist feels at ease working with this interpreter. Indeed, they have been working together for a long time and some evidence of their interactional commonality has been discussed in a prior study (Ticca & Traverso, 2017b). As stated by the psychologist (Lucie henceforth), the presence of the interpreter does not generally interfere with her therapeutic work. On the contrary, she considers the interpreting activity, as well as the interpreter’s spontaneous interventions or additional information she might offer with respect to what was actually produced by the patient, as important contributions to her own specialist interpretive work, hence a sort of a therapeutic intervention in itself (Khelil, 2004). More generally, in this type of psychotherapy the discursive activities proposed by the specialist have multiple functions and purposes, including that of making a diagnosis concerning the psycho-emotional state of the user or that of promoting mental, emotional, behavioural, and social changes. The work of 'interpretation' is therefore central in these sessions, where language becomes the subject as well as the object of the therapist's attention (Greenson, 1977). When the patient and the therapist do not speak a common language, the intervention of an interpreter seems to be the most suitable solution for this kind of therapeutic intervention. However, if it is true that the interpreter helps to build mutual understanding between therapist and patient, her translating activity brings about an inevitable modification of the original talk. This, in turn, can have an impact on the therapist's interpretative work. Without entering into the merits of the different postures taken by the therapists with respect to the presence of a translator in the interaction and of such interpreting activity (considered the exclusive prerogative of the therapist versus a collective activity for which the therapy can only benefit from the interpreter’s presence, see De Pury, 1998; Bot, 2003, 2005; Khelil, 2004; Boivin et al., 2011; Ticca & Traverso, 2015a), we consider it important to invite reflection on the impact the interpreter’s choices may have on the unfolding of the psychotherapy session. The analysis we propose in the next section addresses this as well as other issues. Raul’s personal story, which is partially evoked at different moments of this consultation, concerns his sudden migration from Angola due to persecution related to his affiliation with an anti-government association. Some serious prior events, such as his parents’ death, were somehow linked to this political involvement and contributed to his decision to escape from his native country. Having shared with the therapist (and the interpreter) his thoughts of committing suicide in a prior visit, the therapist asks him whether such thoughts might be related to his feeling of culpability as for his parents’ death. After refusing this suggestion, Raul states that his arrival in France has not led to an improvement in his life conditions, as he had hoped, but quite the contrary. This observation leads him to add então to triste porque sou uma pessoa que não foi nascido que é pra viver feliz, “I am sad because I am a person who was not born to be happy.” The sequence of interaction we will focus on occurs right after this observation (and its translation made by the interpreter, not shown in the extract provided). The psychologist then asks the patient whether he thinks that a curse or fate could be dogging him. 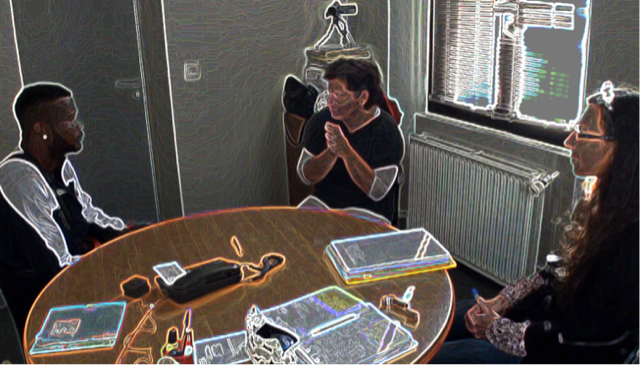 In the transcript of the video-recording presented below, which will be the focus of this analysis, the participants are represented with three capital letters (for the description of the symbols used, see the appendix at the end of the article): PSY: Lucie, the psychologist, PIA: Adela, the interpreter, PAT: Raul, the patient. Each turn contains two lines: the original turn at talk appears in a first, numbered line; the translation into English of the turn originally produced in French and Portuguese is written in italics in a non-numbered line just below the corresponding original turn. In lines 01-03, the therapist initiates a new activity which, as mentioned before, is topically linked to Raul’s previous commentary on the impossibility of being happy. With her question, Lucie displays her understanding of what the patient has just said, and offers a proposition about the possible reasons behind Raul’s statement: she first asks Raul whether he thinks he is the object of a curse (hh est-ce que parfois peut-être/ c’est comme une euh: une pensée de de malédiction), and next she proposes something less precise and specific, more fatalistic (de quelque chose un petit peu d'(a; en)- (0.8) du sort qui pourrait s’acharner). If we look closely at the turn composition, we immediately notice the occurrence of hesitation markers (euh:, une pensée de de), intra-turn pauses (0.7, 0.8), minimisers (quelque chose un petit peu), and markers of uncertainty (parfois peut-être, qui pourrait). This shows at least two, intertwined things. First, by being cautious and by offering two tentative options to describe Raul’s case, Lucie treats the whole issue as ‘delicate’ (Hakaana, 2001; Kerbrat-Orecchioni, 2004; Learner, 2013). Second, the very fact of offering Raul two distinct, possible reasons to explain his situation turns out to be relevant as far as clinical practice is concerned. We will come back to this point in section 4.2.2. Let us now have a closer look at the way the interpreter renders the psychologist’s question. First of all, she focuses on rendering the first part of the question, concerning the possible presence of a malédiction. She does so by preserving the same sense of delicacy observed in the original turn, as revealed by the reformulations, repairs, and pauses she produces (sera que tu pensas que o que estas a pensar; que não podes:: enfim que é impossível actualmente tu ser feliz). What we notice is that Adela then carries on proposing an extension or explication of the word malédiction, using a word that does not make sense in Portuguese, sorteio (sabe o que é/ (1.2) uma um sorteio como é que a gente diz/ ajuda-me .h um::, lines 06-07). We cannot be sure here whether she is actually trying to explain the word malédiction or rather facing the translation of the French word sort used by the psychologist (line 03). Whatever she is doing, we can easily perceive her difficulty: she directly solicits Raul’s participation (ajuda-me .h um::, line 08) and then continues by evoking a shared cultural experience (lines 11-13). This results in a long sequence, where Raul first admits he does not understand (line 10), then says he does (line 14) while nonetheless disaffiliating with Adela’s explanation and suggestion (line 19) (see Stivers 2008 for a definition of affiliation/disaffiliation in conversation). While we might suppose that Raul’s first incomprehension is due to the interpreter’s difficulties in translating, his disaffiliation might also be oriented towards Adela’s evocation of a mutual cultural background (made manifest by the use of ‘you know’ and the inclusive personal pronoun sabe nas nossas credencias, line 11), in which beliefs of “curse” and “evil eye” are common. Indeed, Raul resists sharing this common ground and implicitly rejects the first possible reason for his unhappiness offered in line 02. By not translating the less culturally specific option, that is, that is just fate, Lucie offered in line 03, the psychologist’s multi-layered interpretation of the patient’s problem is rendered in a rather simplified way. The outcome of this choice on the interpreter’s part is twofold. On the one hand, it limits Raul’s choice of an answer to the sole ‘cultural’ proposition, which, as we have seen, he refuses. On the other hand, it leaves the psychologist without a complete answer to her question, with all the consequences that this may have on both her comprehension of Raul’s situation and on Raul’s own representation of the psychologist’s understanding. Finally, it is important to point out that, as the sequence unfolds, the psychologist is oriented towards the interaction taking place between her two co-participants. At no moment does she disengage from the interaction or get involved in a parallel activity, something that could have an impact on the way the dyadic interaction unfolds (on doctor’s activities during dyadic sequences see Pasquandrea, 2011, 2012). This is visible from the images below (fig. 2 and 3). In other words, the interpreter’s choice of what to translate, despite her difficulties, is not attributable here to contextual reasons, such as a momentary disengagement of the therapist from her two co-participants’ interaction. Let us now turn to a discussion that draws on several notions emerging from previous studies on conversation analysis as well as from clinical knowledge gained through fieldwork and further systematic encounters with mental care practitioners. From the perspective of conversation analysis, what Lucie does in lines 01-03 can be considered a ‘formulation’, through which she offers her best description to identify a particular object (e.g. Raul’s thinking) (Schegloff 1972). This turn thus should not be considered as a repair (that is, an action meant to mend or correct something previously said, Schegloff, Jefferson & Sacks, 1977) in which the second part of the turn is correcting the prior one. Viewing the two segments as two separate propositions that offer the best description of a particular object is indeed relevant here. From the perspective of the mental care professionals we have interviewed, and with whom we have discussed these data, attributing the patient’s unhappiness to a “curse” rather than to “fate” does not lead to the same clinical understanding. As a matter of fact, being aware that patients feel they may be victims of a curse can be important in diagnosing depression. What the therapist is likely trying to do here is to encourage the patient to express any feeling possibly related to such a mood disorder. The short and vague answer she receives (bom:: isso (0.4) não sei não sei, line 19) after the extended dyadic exchange between her two co-participants does not respond to the therapist initial, twofold question. The effort made by the interpreter to simplify the therapist’s question, either for her own sake or for the patient’s, turns out to be inefficient in terms of helping producing an appropriate response to the initial question. The analysis of the above interaction allows us to grasp the complexity of routine activities – such as the production of question-answer sequences – in multilingual psychotherapy consultations. One of the aspects that emerges from the analysis is the difficulty that interpreters may have in translating original turns at talk. Here we witnessed how Adela struggles to deliver the therapist’s question, and how she engages in a dyadic exchange with the patient to do so. This is not an inadequate practice per se – dyadic exchanges can help for instance in co-constructing or disambiguating meaning (see, among others, Ticca & Traverso, 2015b). Nonetheless, it is in this particular case unproductive: Raul disaffiliates and refuses to accept the (supposed) interpretation regarding his situation. Also, this exchange with the patient keeps the therapist out of the conversation, thus making any further delay in returning to the triadic configuration (in order to further explain or translate the previous talk) somehow unreasonable. There are a few insights that can be gained from this short but interactionally rich episode which can be useful both for interpreters and for mental and health care professionals working with the aid of an interpreter. Complex questions, involving fine or subtle distinctions between two or more propositions, may be simplified by interpreters, either for the sake of facilitating the non-native speaker’s understanding, or due to real difficulties in translating the original turn. Whatever the reason, in order to prevent this from happening, one possibility would be to present the two propositions separately (i.e. in two different turns at talk). Alternatively, debriefing the interpreter about the relevance of translating the nuances (manifested lexically, syntaxically, prosodically, etc.) embedded in the healthcare professional’s talk might also be appropriate. How to handle cultural issues such as the one observed here is, indeed, an open question. In this case, the patient displayed no collaboration in the construction of a shared cultural environment where the origin of his malaise could be identified. As we have seen, letting the interpreter deal with this task led to a minimal response on the patient’s part. Having the specialist establish the appropriate bases upon which to explore culturally-driven behaviours or beliefs may therefore be required in order to avoid attributing cultural identities which may cause discomfort on the part of one’s interlocutor and therefore be rejected. In terms of the use of this type of video-recorded data for training purposes, a few aspects are worth pointing out. We usually proceed in two main stages: the preparation of the activity, and then its delivery and accomplishment. As for the former, it is important to present the data in an accessible manner, adapted to the public and its competencies. Likewise, when showing the data, either the video-recordings or the transcriptions or both, it is crucial to ‘guide’ the data viewing and the ensuing analysis. As a matter of fact, data collected in its natural and spontaneous unfolding is extremely rich and can inspire a large and diverse variety of analyses and inquiries. While this richness is valuable for the researcher, teacher, or trainer her/himself, it is surely difficult to manage when it emerges in a class (unless we plan for this to happen). Generally, in order to achieve our teaching/training objectives, we want participants to focus on a specific object of analysis. Setting the context of the analysis and introducing one or two phenomena for examination helps the participants keep focused and explore the details of the interaction in greater depth. This makes it possible for them to become aware of the impact that recurrent and ‘unconscious’ micro behaviours and actions have on daily professional practice. An ultimate aim is indeed that of guiding the trainees to look at the activity as a process of coordination and interpretation that takes place in interaction (Fillietaz, 2014). The advantages of working with naturally occurring interactions, collected as they unfold in real time, has been underlined here and in prior, already mentioned studies. One aspect that is perhaps new in the experience presented here is the implication for health and mental care professionals as well as interpreters of examining the data collected. In some cases we have been able to work with the same doctors that are video-recorded, whose practice has thus been analysed from different perspectives (that of the researcher and that of the social actors who analyse and make sense of their own practice). This interdisciplinary experience is important because it allows us to offer an interactional perspective on professionals’ practice, and to enrich our own understanding thanks to the insights they share. As we are navigating a domain - that of mental care - that is not our own, it is easy to overlook certain elements or phenomena that are instead relevant for the specialists. This is the case of the excerpt presented here, where the psychologist’s question embeds some clinical meanings that would otherwise go unnoticed to a non-expert eye like ours. At the same time, our expertise about the functioning of interactions and the impact that participants’ multimodal behaviours and choices have on the co-participants’ actions and understanding, becomes relevant both for the specialists and the interpreters. This interdisciplinary approach to training gathers researchers ((socio)linguists, sociologists, psychologists, psychiatrics etc. ), health care practitioners, and interpreters around the same table. There, each other’s expertise and knowledge are put at the service of the understanding of specific episodes of authentic consultations, greatly improving all parties’ practice and comprehension of what goes on, and why. We therefore encourage scholars working with data in which specialist knowledge is involved to consider engaging in a similar experience; it will undoubtedly prove time-consuming and sometimes difficult, yet ultimately enriching. Antaki C. (2008), Formulations in psychotherapy, in Peräkyla A., Antaki C., Vehvila¨inen S. & Leudar I. (eds), Conversation analysis and psychotherapy, CUP, Cambridge: 107–123. Antaki C. (eds) (2011), Applied Conversation Analysis, Palgrave Macmillian, Basingstoke. Baraldi C., Gavioli L. (a cura di) (2012), Coordinating Participation in Dialogue Interpreting. John Benjamins, Amstardam/Philadelphia. Belmant P. (2001), Souffrance d’étrangers, in Rhizome, 4: 9. Boivin I., Brisset C., Leanza Y. (2011), Interprétation et interprétariat: chassé-croisé en thérapies analytiques plurilingues, in Filigrane, 20 (2): 107–122. Bot H. (2003), The myth of the uninvolved interpreter interpreting in mental health and the development of a three-person psychology, in Brunette L., Bastin G., Hemlin I. & Clarke H. (eds), The Critical Link 3, John Benjamins Publishing company, Amsterdam: 27-35. 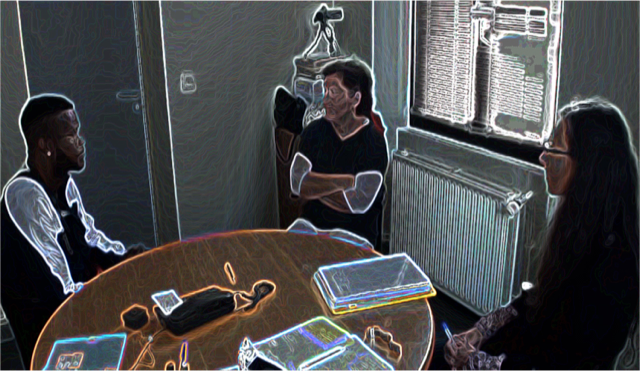 Bot H. (2005), Dialogue Interpreting in Mental Health, Rodopi, Amsterdam. Chambon N. (2017), Solidarisations. Enquête sur les migrants en situation irrégulière et leurs soutiens, PhD Dissertation, Université Lyon 2, manuscript. Couper-Kuhlen E., Selting M. (2018), Interactional Linguistics: Studying Language in Social Interaction, Cambridge University Press, Cambridge. Deppermann, A. (2011), The study of formulations as a key to an interactional semantics’, in Human Studies, 34/2: 115–128. De Pury S. (1998), Traité du malentendu. Théorie et pratique de la médiation interculturelle en situation clinique, Le Plessis-Robinson, Institut Synthélabo. Drew P. (2003), Comparative analysis of talk-in-interaction in different institutional settings, in Glenn P., LeBaron C. & Mandelbaum J. (eds), Studies in language and social interaction, Erlbaum, Mahwah, NJ: 293–308. Fillietaz L. (2014), L’interaction langagière: un objet et une méthode d’analyse en formation d’adultes, in Friedrich J. & Pita Castro J.C. (eds), Recherches en formation des adultes: un dialogue entre concepts et réalité. Dijon: Editions Raisons et Passions: 127-162. Filliettaz L., De Saint-Georges I., Duc B. (forthcoming), Trajectoires d’apprentissage en formation professionnelle initiale: une approche interactionnelle et multimodale. Paris: Presses universitaires de France. Gavioli L. (a cura di), (2009), La mediazione linguistico-culturale: una prospettiva interazionista, Guerra, Perugia. Greenson R. (1977), Technique et pratique de la psychanalyse, Presses universitaires de France, Paris. Haakana M. (2001). Laughter as a patient’s resource: dealing with delicate aspects of medical interaction, in Text 21: 187–219. Heritage J., Maynard D. (eds), (2006), Communication in Medical Care: Interaction between Physicians and Patients Cambridge University Press, Cambridge. Kerbrat-Orecchioni C. (2004), L'adjectif petit comme procédé d'atténuation en français, in Travaux et Documents 24: 153-175. Kitzinger C. (2005), Heteronormativity in action: Reproducing the heterosexual nuclear family in after-hours medical calls, in Social Problems 52(4): 477-498. Lerner G. H. (2013). On the place of hesitating in delicate formulations: a turn-constructional infrastructure for collaborative indiscretion, in Hayashi M., Raymond G. & Sidnell J. (eds), Conversational Repair and Human Understanding, Cambridge University Press, Cambridge: 95–134. Licoppe C., Verdier M. (2013), L’interprétariat par visioconférence au sein des chambres de l’instruction en France: une étude conversationnelle de l’activité d’interprétariat dans un dispositif interactionnel mediatise, in Langage et Société 153(3): 109-131. Mehan H. (1979), Learning lessons: Social organization in the classroom, Harvard University Press, Cambridge. Merlino S. (2012), Négocier la transition de la parole du traduit au traducteur: l'organisation séquentielle et multimodale de la traduction orale, PhD dissertation, Université Lumière Lyon 2, manuscript. Pasquandrea S. (2011), Managing multiple actions through multimodality: Doctors’ involvement in interpreter-mediated interactions, in Language in Society 40 (4): 455–481. Pasquandrea S. (2012), Co-constructing dyadic sequences in healthcare interpreting: A multimodal account, in New Voices in Translation Studies 8: 132-157. Pekarek Doehler S., Bangerter A., De Weck G., Filliettaz L., Gonzalez Martinez E. & Petitjean C. (eds) (2017), Interactional Competences in Institutional Settings: from School to the Workplace. London: Palgrave. Sacks H., E. Schegloff, G. Jefferson (1974), A simplest systematics for the organization of turn-taking for conversation, in Language 50: 696–735. Schegloff E. A. (1968), Sequencing in conversational openings, in American Anthropologist 70: 1075-1095. Schegloff E. A. (1972), Notes on a conversational practice: Formulating place, in Sudnow D. (ed. ), Studies in social interaction,Free Press, New York: 75–119. Schegloff E. A., Jefferson G., Sacks H. (1977), The Preference for Self-Correction in the Organization of Repair in Conversation, in Language 53: 361-382. Sidnell J., Stivers T. (eds) (2012), Handbook of Conversation Analysis. Wiley-Blackwell, Oxford. Stivers T., Mangione-Smith R., Elliott M. N., McDonald L. & Heritage J. (2003), Why do physicians think parents expect antibiotics? What parents report vs what physicians believe, in The Journal of Family Practice 52 (2): 140-147. Stivers T. (2008), Stance, alignment, and affiliation during storytelling: when nodding is a token for affiliation. Research on Language and Social Interactions, 41(1), 31–57. Ticca A. C., Traverso V. (2015a), Interprétation, traduction orale et formes de médiation dans les situations sociales, in Langage et Société 153(3): 7-30. Ticca A. C., Traverso V. (2015b), La bonne information: quand les interprètes corrigent les réponses du patient au docteur dans la consultation médicale, in The Interpreters’ Newsletter 20: 161-174. Ticca A. C., Traverso V. (2017a), Participation in bilingual interactions: Translating, interpreting and mediating documents in a French social centre, Journal of Pragmatics 107: 129-146. Ticca A. C., Traverso V. (2017b), Parole, voix et corps : lorsque l’interprète et le soignant s’alignent dans les consultations avec migrants, L’autre – clinique, culture et société, Vol. 18 N. 3: 304-314. Traverso V. (2003), Rencontres interculturelles à l'hôpital: la consultation médicale avec interprète, in TRANEL 36: 81-100.
. In all, there are 20 mental health consultations in our corpus of data, 11 of which with an interpreter.
. The word used in Portuguese, sorteio, which means ‘raffle’, is similar to the French item sortilège ‘spell’, which would be an appropriate translation for the word used by the psychologist, malédiction. It might be possible, but we are only speculating here, that the French word is interfering with the interpreter’s lexical choice in Portuguese.
. On the phenomenon of convergence and affiliation observed between these two participants, see (Ticca & Traverso, 2017b).
. The notion of formulation has been the focus of a large number of studies, to which we cannot accord here the attention they would merit due to space limitation. For references, see Drew (2003), Antaki (2008), Deppermann (2011), among many others.
. The training courses are organised by the Orspere-Samdarra of Vinatier Hospital and their contents and formats have been elaborated by the members of the REMILAS project. Anna Claudia Ticca teaches language sciences at University of Grenoble and is also researcher at the ICAR lab, Ecole Normale Supérieure of Lyon. She studies social interactions taking place in different settings (both institutional and informal) and languages (e.g. English, French, Italian, Spanish). On the basis of ethnographic work, which includes the collection of video-recorded interactions, she analyses multimodal phenomena (talk, gaze, gestures, body posture, etc.) as well as more (inter)cultural issues in order to make sense of both monolingual and multilingual interactions.